Boom / Search Engine Optimisation / SEO Basics: Search Query Operators to Help You Find What You Need – Fast! SEO Basics: Search Query Operators to Help You Find What You Need – Fast! Since my last SEO Basics post, I’ve started working through the Distilled U course offered by the online marketing company, Distilled. While I haven’t yet had the opportunity to progress far beyond what I already knew in their courses, it has helped solidify my understandings of the basics in SEO, such as how a search engine works, how they and the internet has developed and how a the ranking of a page is decided. The last section I read through was about query operators and their use in Google and other search engines. Query operators are really useful commands to help narrow down the results given back by the search engine. For instance, putting the search query inside speech marks would return results containing only that query. It’d look like this in the search bar: “query”. There are other really cool query operators out there too, such as site: and inurl:. Site: searches for results just on the specified website and inurl: will search for a page with a url containing what you want. The best bit? These two operators can be combined. 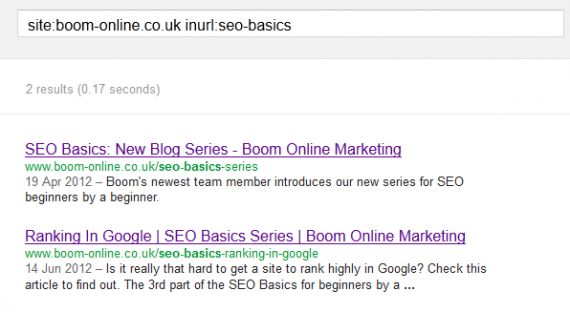 Head over to Google and search the following: site:boom-online.co.uk inurl:seo-basics. You’ll get two of my previous blog posts as results, because they’re on this site and have seo-basics as part of the url. Brilliant! Twisting that on its head, another useful tool is negative operators. Putting a minus sign in front of one of the aforementioned operators will exclude whatever is specified from the results. If you don’t want to see any results from a certain site, for example, use –site: and then the url. Easy! So why would you use these operators? Like I said at the start, query operators can help narrow down your searches so that you can find something much more specific. If you’re looking for pictures on a certain website, using site: in Google Images will only return pictures from that website. It’s also really handy when you know that a site has something on it, but you can’t find it exactly. Google does the work for you! For the purpose of SEO, I’ll often use them to find sites to submit guest posts too, usually by putting “guest post” or “write for us” at the end. This removes a lot of websites that wouldn’t be relevant to pitch too and saves a lot of time. There are loads of other operators out there for each search engine, but here’s a link to a list of the Google operators on the SEOmoz site so that you can find out more and try some out yourself.